Yakitori is grilled skewered chicken. Very simple yet delicious. 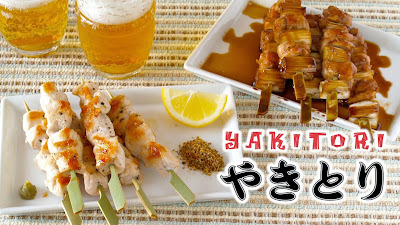 I received many requests for Yakitori sauce (Tare) recipe, so I decided to make this tutorial. Also, I will show you how to make salt (Shio) flavored Yakitori, too. 1. To make Tare (Yakitori sauce), place soy sauce, Mirin, and sugar in a pot and bring to a boil. Then turn down to low and simmer for 5 minutes. *You can store the leftover sauce in the fridge for a month and use it for other dishes like Teriyaki. 2. Remove the skin from the chicken if desired. Then cut into small bite-sized pieces. Cut the long onion into 2/3-inch pieces. Season the chicken breast with salt and pepper for Shio (salt) flavor. 3. For Tare (sauce) flavor, put long onion and chicken thigh alternately onto bamboo skewers. For Shio (salt) flavor, put seasoned chicken breast onto bamboo skewers. 4. First, cook the Shio (salt) flavor. Heat a thin layer of cooking oil in a frying pan, place Shio (salt) flavored Yakitori, and cook on high until golden brown on both sides. Then cover and cook on low for 3 minutes until done. 5. Next, cook the Tare (sauce) flavor. Heat a thin layer of cooking oil in a frying pan, place Yakitori with long onions, and cook on high until golden brown on both sides. Then drizzle with 3 tbsp. of Tare (Yakitori sauce), cover, and cook on low for 2 minutes. Then cook on high for 1 minute until the sauce thickens. 6. You can enjoy the Shio (salt) flavored Yakitori with lemon wedges, Shichimi-togarashi (seven flavor chili pepper), or Yuzukosho (Japanese chili pepper paste) if you like.